All-Weather Floor Mats were intended to give the best possible protection for your 2017 Toyota Highlander's floor. Many of our front and rear mat applications are model specific, while others are assigned as the best possible fit for your 2017 Toyota Highlander from our many shapes and sizes. Some rear mat sizes are designed to be trimmed so that they may be customized to fit almost any vehicle. I am a student at the University of Kentucky and when I am not in school my time is spent teaching horse back riding lessons and riding. I own a 2 yr old Lab mix named Rondax that travels everywhere with me and by the end of the day both of us are pretty dirty. Between dirty boots, dirty paws and dirty horse equipment, my vehicle usually looks like something 'Pig Pen' would drive on Charlie Brown. My Dad recently purchased the All-Weather floor mats for my car and now my car doesn't look like a rolling dust bunny. Rondax has a nice place to lay in the back where the cargo mat catches any type of dirt he may have found that day and I don't have to worry about where I put my boots on the mats because as my Dad said, "You'll have to try to mess up the carpets with these mats in!" These mats are awesome and fit perfectly with my messy lifestyle! Thanks for making these great accessories! Fit perfectly and well made! First of all, shipping was super fast! The floor mats arrived 3 days after I ordered them. They came as a set in one box via Fed Ex. They are very heavy and well made. The driver's floor mat even came with new retention clips to replace the original ones. I ordered the set that included the front, middle, and rear for 2008 Toyota Highlander Sport. Of course the driver and front passenger mats are separate pieces, but what surprised me is that the middle and rear area mats came as two separate pieces each also. The right side of each area has grooves that the left overlaps and it looks like one big piece in each area. This is awesome because the pieces are so much easier to take out and clean. My wife has the floor liners in her GMC Acadia and though they protect well, the rear piece is a pain to remove and clean because it's one big piece. The floor mats fit my Toyota perfectly. The black color matches my black interior. I expect to get many good years of use out of these. WeatherTech definitely makes a superior product. The fact that they are made in the USA makes them even better! Thanks, WeatherTech! I ordered three piece; front, 2nd row and cargo area mats. Cargo area fit fine with no mods needed. The 2nd row required quite a bit of trimming and some heat reforming. The front mats were appalling. Extensive trimming and reforming with heat gun was needed. Surly NOT the laser fit advertised. Now that I've reworked them, they work fine. I purchased the floor mats for my husband for Christmas and he loves them ( I gave them to him a little early). The look great but more importantly they fit the way they are supposed to. So I just purchased the Cargo Liner for his birthday. Thank you for making your product as advertised. Just wanted to say the all weather mats are an excellent product, fit great, and your service was top notch. I was talking to a friend at work about her Highlander and looking it over before I purchased my own. I noted her floor mats were VERY nice and heavy duty. I asked about them and she said they were 7 years old! I was blown away..the mats you get at Walmart or an auto parts store last about 10 minutes. So when I got my car I ordered a complete set for it and I am so glad and very happy I did. They are extremely heavy duty and make my car look great! Best product by far!!! I bought my first cargo liner for my wife's new Kia Sportage in 2001. It allowed us to take out the garbage without ruining the carpet. She liked it so much that I had to buy her the floormats. Then she bought a mini van and I bought her the floor mats. My son bought an Infiniti G35 and his Christmas present was a set of floor mats. Then when visiting my 89 year old father in August 2008, he took the garbage to the recycling center in his Highlander. I then gave him a cargo mat for his 90th birthday. He was elated! I bought my parents a Christmas present and my mother informed me that it was for her and I needed to get my father the floor mats for the Toyota. So I ordered them and he recieved them as a late Christmas present. My parents live in MN and love them during their harsh winters. My son also gave his mother a cargo mat for her minivan. We love your products and wouldn't buy any other. Best value for your dollar and they look and work great. Living in Minnesota, the Winter way of life is to deal with globs of snow carrying all the salt, sand, and debris that hangs onto your shoes or boots. When we purchased our new Toyota in December it was obvious that the carpeted floor mats provided in the package would just get wrecked in no time. My neighbor suggested your products to me and I am happy to say that this has been a pleasant experience, from the ordering and delivery process to the performance of the All-Weather Floor Mats. The mats do exactly as advertised, trap the water/sand/salt and drain it to the back of the mats and away from hanging pant cuffs. Our car interior will be saved from the crusty, salty damage my floor mats in my other car has had to endure. We are SOLD. As I shop for my next replacement vehicle I guarantee you I will be searching your site to ensure you make the All-Weather floor mats for that car. Thank you for such a GREAT product. I love these mats! They are sturdy, easy to clean, and hold up to 32 ounces of soda (guess how I found that out - yeah, it was a "big gulp"). The mats fit perfectly and look great! 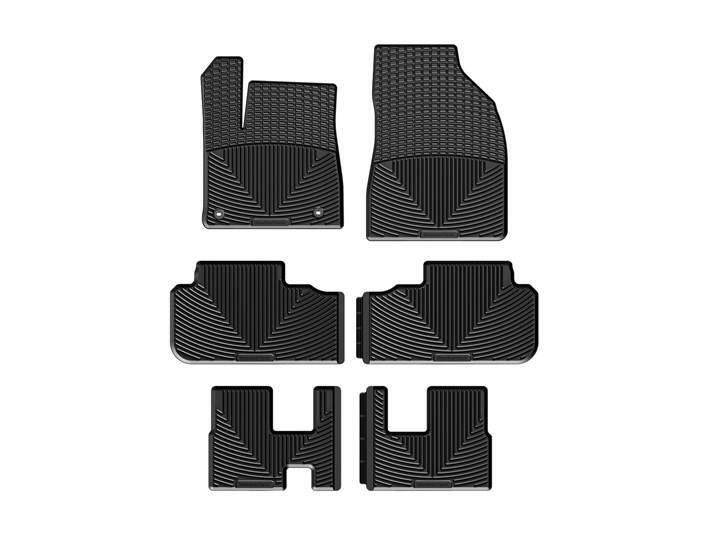 I would recommend these mats to anyone looking for great-looking, well -fitting, sturdy, easy-care, reasonably-priced floor mats for their car!